When we think of an Education Champion, sometimes we narrow our focus too much. We think only of those who are working in the most impoverished areas, or those who are working with what we would consider the most difficult children. It is that same narrow focus that School on Wheels’ 2017 Education Champion, Cassie Brooks fights against every day. Cassie serves as a physical education & health teacher for Brownsburg Middle Schools. During the interview process for Education Champion, the judges panel asked Cassie what, if anything, she would change about her current educational environment. Her answer: “The belief that we are doing fine.” She talked about helping her community understand that even though there are a lot of families that truly are doing fine, there are also a lot that are struggling—living with food insecurity and financial insecurity. In addition to helping all students learn to take care of themselves physically & emotionally, this group of students who might struggle a little more than others have become Cassie’s heartbeat. The list of “additional roles,” “awards,” and leadership experiences on Cassie’s resume is much longer than her actual job responsibilities. She simply does not stop when it comes to providing the best for the students she works with. And most times, providing the best means helping her students understand how they can help each other. In just one project, Cassie worked with students in her school to reduce the stigma that comes with food insecurity. Knowing how many students were eligible for free breakfast, and how many students were actually accessing it, Cassie realized a disconnect. In working with students she realized that getting breakfast at school created a stigma. To get breakfast at school you are released from the bus early to sit in the cafeteria eating breakfast while the rest of the students socialize with their peers in the hallways. A simple solution, that required a lot of hard work and persuasion on the part of Cassie and her student leaders, a grab n’ go breakfast program. This program allowed students to access free breakfast without be so set apart from their peers. The result: more kids that were starting the school day well-fed and ready to learn! 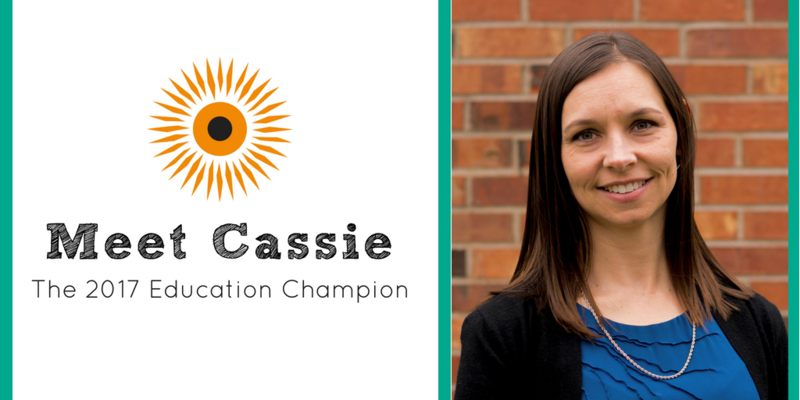 When Cassie was selected as the 2017 Education Champion, she knew exactly how she intended to spend the money that came with the award. She wanted to provide summer resources for families that were facing food insecurity and financial instability. She wanted to ensure that they had extra food over the summer, that they had recipes for easy and healthy food, that they had information on free or low cost community resources, and that they had activities to keep them active over the summer. A few weeks ago we visited Cassie and a couple of her students as the worked to assemble the backpacks, which were distributed before the Memorial Day weekend. The bags have been named Family Fit bags and are an enhancement of her ongoing project to fight food insecurity. Student Leaders in Cassie’s Fuel Up to Play 60 club helped to determine what should go in the bags. The final list included footballs, badminton racquets & birdies, sidewalk chalk with a list of activities, Frisbees, a cookbook, a guide of local parks, and so much more! When thinking through the logistics of the bags, Cassie asked her leaders if they should unwrap everything before they put it in the bags. One student replied, “I think we should keep everything wrapped. It might be nice for them to unwrap new things.” This is what it is all about. Helping students understand the plight of their peers. Helping them to be more empathetic and more understanding. Not only helping those in need of physical items, but helping those in need of more awareness of the world around them. Not only is Cassie Brooks a true Education Champion, she is coaching many students to become champions for their peers. Thanks, Cassie, for your dedication and hard work. We’re so proud to know and work alongside you! Previous StoryOne Fish, Two Fish, New Fish!